Shri Eknath Ranade, President, Vivekananda Rock Memorial Committee and Vivekananda Kendra, Kanyakumari, Is no more. But he lives beyond death in the inspiring, magnificent Vivekananda Rock Memorial off the Kanyakumari shore and even more in the living, growing memorial–Vivekananda Kendra–a spiritually ­oriented Service Mission, consisting of men and women, specially young men and young women, dedicated to the twin tasks of man-­making and nation-building inspired by the ideals of Swami Vivekananda – Renunciation and Service, Tyaga and Seva. Eknathji lived and died to build, to foster, to nourish with his vision, his will, his wisdom, his life-long Sadhana and Tapas, his sweat, his tears, his blood remaining dedicated and dynamic to the last day of his life, 22nd of August 1982, when he breathed his last at 2.45 p. m. after a sudden, massive heart attack in his office at Madras while on his way to Kanyakumari. He was returning after a long tour which had taken him to Kashmir, Delhi, Ajmer, Ahmedabad, Bombay, Nagpur, Poona, Sholapur, etc., to visit the various Vivekananda Kendra Branches and to meet the life-workers of the Vivekananda Kendra, whom he had trained with such care and affection for devoted, selfless service, which was both a passion with him, as also an inexhaustible source of abiding inspiration to him, which kept him ever a tireless worker, undeterred by difficulties, undaunted by obstacles and problems, accepting them as challenges, as hurdles to be crossed with courage and confidence, treating them as opportunities for strengthening oneself for more work, harder work, more dedicated work, more selfless work. Eknath Ranade was a Karmayogi, wedded to work, dedicated to Nishkama Karma, Self-less Seva, of which he was an embodiment and his life a shining, inspiring example. There is no doubt, he will live in and through the dedicated work done by the Vivekananda Kendra through its life-workers at its many branches, in different States, including Port Blair in Andamans, where they are running a school with over 300 students, Imphal in Manipur, Gauhati and Dibrugarh, Tinsukhia in Assam, in so many places in Arunachal Pradesh where they are working among the Tribals, the most neglected children of Bharatmata, running among them for their children, both girls and boys, with the devoted love and labour of their lady-life-workers over a dozen schools, including Residential and Girls Schools, with the co-operation and appreciation of both the people and the Government. The people have been inviting them cordially to open more and more schools in their areas for the benefit of their children and the people in the area, for the teachers, in these schools, some of them as far away and inaccessible as in Tafragaon, are dedicated and devoted souls; who even during vacations do not go on a holiday to their own home but hold camps and like to meet parents and other people, young and old, in different areas to wo(Prof. K. N. VASWANI Ex Vice-President, Vivekananda Kendra, Kanyakumari)rk among them to serve them. They seek to understand them, learn about their manners and customs, their language and culture, to appreciate them and to build bonds with them for their national integration as an invaluable element in the beautiful, multifaced, rich and varied culture of India, which accepts, assimilates and enriches and inspires and unifies us all, and which is like a garland of many flowers, or like a symphony of many tones and tunes, woven into a beautiful inspiring harmony, precious for all. It has been singing through the centuries, for ages untold, the rich resonant song, the ineffable music of 'Unity in diversity.' which is the need not only of India that is Bharat, but of the whole world, entire Humanity, which without its message of love and wisdom, of Harmony and Unity, would fall a prey to venomous, warring creeds. It would fall a victim to hatred and disharmony and to destruction, devastation and death, through the multiplica­tion of monstrous means of mass destruction devised by modern science, with its enormous efficiency, in its unparalleled unwisdom and exceptional technical competence, misdirected to inhuman ends which may result in diabolic deeds, which would be a shame to civilization and a blot on culture and humanity. Swami Vivekananda's message proclaimed at the World Congress of Religions at Chicago on 11th Sept. 1893, was therefore the message of Universal Brotherhood, of fraternity and friendship between the nations and among their people, the world over. This message is not only very relevant but even indispensable today to prevent a human holocaust. And Vivekananda Rock Memorial, erected opposite the ancient Kanyakumari temple at the land's end of the Indian sub-continent, where, in Gandhi's words, the three seas meet to wash the feet of Bharatmata, is a national monument in the true sense of the term, for it has been built at a cost of 1.25 crores by collecting small donations of one or two rupees each from lakhs of common people and not only from the rich or the Government. Making it national in this sense too, was to the credit of Eknath Ranade, who had so planned it and pursued this plan with vigour and skill. Karmayogi as he was he used often to quote from the Gita his favourite words "Yoga is skill in action." Built as a memorial to one of the greatest sons of India and a prophet of Universal Brotherhood and World Harmony, the Vivekananda Rock Memorial is like a lighthouse shining in the dark, beckoning to India and the world to follow the path of harmony of religions, of faiths, of races, of creeds and castes. It sends out a message of world unity, of understanding and appreciation, of co-existence and co-operation, and calls for "selfless service of God's creation as true worship of the Lord." Eknath Ranade, the chosen instrument for the spread of the vital, vigorous, man-making, nation-building and world-unifying message, was not only the patient builder of the Vivekananda Rock Memorial which took 6 years to build (1964-1970) being inaugurated on 11th Sept. 1970, and which was a sturdy, impressive, magnificent monument in granite, to the memory of that magnificent personality Swami Vivekananda, but Eknath Ranade was also the wise visionary, the founder of the Vivekananda Kendra, a Service. Mission of active, dedicated men and women, who were to be the living growing memorial to the message of the matter Swami Vivekananda who had said in his wonderful inspiring prophetic words: "A hundred thousand men and women, fired with the zeal of holiness, fortified with eternal faith in the Lord and nerved to lion's courage by their sympathy for the poor and the fallen and the downtrodden, will go over the length and breadth of the land, preaching the gospel of salvation, the gospel of help, the gospel of social raising-up and the gospel of equality." These were the words which were the refrain of the one song which in the course of my 11-year-long, continuous, personal association with Eknathji since 1971, I was privileged to hear again and again and he lived and died to translate this dream of Swami Vivekananda into a living reality, an actual fact, through Vivekananda Kendra, the life-workers whom he taught and trained, among whom he lived and worked and died. Eknathji was a tireless worker, an organiser and a great dreamer, with a vision, and a will which will not accept defeat or be dismayed. Even after his last serious, severe and shattering illness when be had a terrible stroke in April 1980 and was laid low, almost near his end and death, he like a valiant, formidable, faith-inspired fighter that he was, gave a long, patient, tough and, victorious fight to Death and won through the battle that time, to the surprise of the doctors and the joy and jubilation of his co-­workers in the Vivekananda Kendra who were like his own daughters and sons, to the joy also of his co-workers in the R. S. S. with whom he had played a heroic and wholesome role in the history of nation-building in India before coming in 1963, at the time of the Vivekananda Birth Centenary Celebrations to his new last phase of work, which was to be a glorious one including the erection of the magnificent Vivekananda Rock Memorial and the founding of the Vivekananda Kendra as a Service Mission, the training of its life-­workers young men and young women, whom he has left behind to work as a dedicated, devoted, determined, humble and harmonious team, to carry on the great task of selfless national service with Swami Vivekananda's inspiring ideals and the example of his dedicated dynamic life before them. While the doctors described Eknathji's recovery from his serious illness as "a miracle," and several senior Swamis of the Ramakrishna Mission with whom he had very close friendly and fraternal relations as "a blessing," Eknathji himself described it to me as "a second life." He said to me: "Vaswani, I was dead for a few months, I had closed my eyes; but now that I am back, it means God still wants me to work." This was his reply to appeals from co-workers who were like his children in the Kendra to co-workers and friends also in the R. S. S. and the Ramakrishna Mission and other sister organisations, and to admonitions and advice also from doctors, "I do not want to rest and rust. I must work and harder to complete my task during the time granted to me. I shall try to be careful. But life without work, is like death to me. God will keep me as long as He wishes, so let me work." This was his way of withstanding any request for rest by him. He had a dream of Vivekananda Kendra, International, as the third phase of his plan for the true memorial to Swami Vivekananda, his vital message for the world, of selfless service and universal harmony. The first meeting of the General Body of Vivekananda Kendra, International, was held at Vivekanandapuram, Kanyakumari, in his room on 7th June 1982 before he proceeded on 30th June on his last tour of India to meet Vivekananda Kendra life-workers and acquaint himself with and give a further impetus to their activities. For him, it was to be the first as also the last meeting. This he did not know, nor we. But some of his words seem now to have contained an un-understood hint, for he said during that meeting: "We are only making a beginning; coming generations will take up the work afterwards." He was the Founder-President of Vivekananda Kendra, International. Eknath Ranade used to call the Vivekananda Kendra, not only a service Mission, with a cadre of dedicated life-workers both men and women, but he also used to call it a Thought Movement, the thought being selfless service. He used to say, how very many or how few we are in the Vivekananda Kendra within our cadre for life will not matter so very much, if we conceive of Vivekananda Kendra as a Thought Movement for selfless service. Let people do selfless service, not for life, for a few years, months, or only days, even for a few hours and not under the auspices of Vivekananda Kendra but under the auspices of any organisation or no organisation at all, absolutely on their own as individuals in their own neighbourhood, in their own family even, teaching or nursing their own servant, whoever is in need but do this as selfless service. The spread of this thought, the inculcation of this idea of selfless service, is the essence of the Vivekananda Kendra work. And spreading this idea even beyond the borders of India, abroad, was his last dream in the form of Vivekananda Kendra, International. He knew that this was only his dream, for he knew he had not the time, not the energy and the strength. But he had cherished another dream, earlier, which he thought was not to be only a dream, but which he wished to translate into a reality. 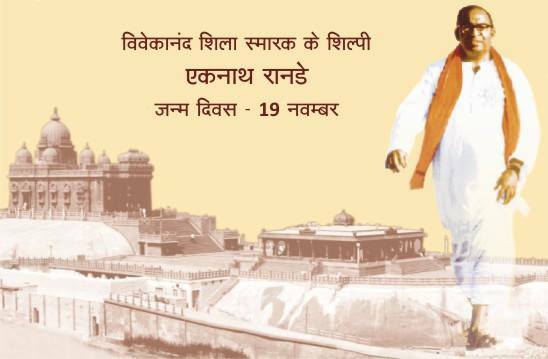 He had thought and planned and also expressed at meetings with life-workers of the Kendra, that with the co-operation and support of well-wishers in all parts of India, in the decennial year of the Vivekananda Kendra, 1982, for Vivekananda Kendra was started in 1972, we should have a branch of Vivekananda Kendra in ever, district of our country. The dream was certainly desirable, but the plan seemed quite ambitious, yet the desire was very much there in him as among the workers. The dream and the plan remain still with us. Eknathji is no more in his body yet he is still here in his dream, his plan, his example of a dedicated life, his pursuit with determination of a set purpose, from which he would not be distracted, for which he would work resolutely, persistently, consistently with a vigour and a will, with determination and dedication, tirelessly and selflessly. Can we learn from his life, his example, to do so? Shall we try? Let each one answer for himself or herself. Who made Eknathji, what he became? Who moulded him? What shaped him? Who gave him the sense of purpose, and the will and persistence to achieve his purpose? Eknath Ranade was born on 19th November 1914, at Timtal in Amravati District, Maharashtra, in an ordinary household, his father Shri Ramakrishna beings a station master. And not very well-to do. The father was a strict disciplinarian, which Eknathji himself continued to be the last day, also and even more with himself, which could be considered to be among the secrets of his success with purposes he set for himself to fulfil. His mother Ramabai was loving and devout, the source of his spiritual leanings which took the shape of selfless service and his devotion to Vivekananda's doctrine "Service of humanity is true worship of divinity" which was Eknathji's watchword, life's Mantra. He was brought up and educated at Nagpur where his eldest brother Kashinath was engaged in some small business. He was educated at the Hislop College, Nagpur, and passed his M. A. in Philosophy from Nagpur University and Law from Saugar University, Madhya Pradesh. His stay in Nagpur was to be the turning point in his life, the central moulding force which shaped and made him, for during his school days, the more formative years, he came in close contact with that moulder of men into humble, yet heroic, dedicated men­–Dr. Hedgewar, the founder of the R. S. S. ( Rashtriya Swayam Sevak Sangh) under whose magic spell, he was drawn into that movement, joining it in 1938 as a whole-timer, a Pracharak, working for them not only in Madhya Pradesh, but also in the north-east region including Bengal, Assam, Orissa, Tripura, Manipur and Meghalaya. He had learnt Bengali and also come in close, friendly contact with Ramakrishna Mission and during the great exodus from East Bengal to West Bengal, with his organising skill and dedication, he devoted himself body, heart and soul to the relief and rehabilitation of the East Bengal refugees serving them in every way. Due to his sterling qualities and devoted work, his skill and insight, he rose to be the General Secretary of the R. S. S. and served the R. S. S. in that capacity with credit and distinction, till April 1962. Thereafter began the new phase of his life. He was destined for the nation-building work by Swami Viveka­nanda in the Vivekananda way. To this he came in 1963, in the year of Vivekananda Birth Centenary Celebrations, issuing in January 1963 as his personal homage, to the great Swami, his compilation of Swami Vivekananda's inspiring words under the caption "Rousing Call to Hindu Nation." So the moulding forces in Eknathji's life have been "Discipline," from his father, "Devotion" from his mother, "Patriotic nation-building urge" from Dr. Hedgewar and the R. S. S. and its spiritual orientation and strengthening from the Ramakrishna Mission, and their integration and final fusion and fruition through the vital, vibrating, man-making message and masterful personality of Swami Vivekananda during the last 20 years of Shri Eknathji's life. First from 11th August 1963 as Organising Secretary of Vivekananda Rock Memorial Committee, then as General Secretary for many years and since 1978, as President of the Vivekananda Kendra, Eknathji has left an indelible mark not only on the land and the country in the form of the Vivekananda Rock Memorial, as a fountain source of inspiration for all, but he has made also an invaluable contribution in the sphere of service organisations by founding and fostering Vivekananda Kendra, which through its selfless exemplary work among Tribals in the north-east in Arunachal Pradesh, and its expanding service-activities in the South in Kanyakumari, has earned enormous goodwill and inspired faith in the role which it and such other organisations can play in the sphere of national reconstruction. And so Eknath Ranade, the man with a Mission, will continue to live in and through his chosen life-long mission of selfless service through the Vivekananda Kendra and all such other Service Missions, whose way he has paved by his devotion, determination and dedication and his tireless striving for perfection.